Max Payne 3 is a third person shooter wrapped in a dark and gritty narrative continuing the seemingly never ending fall from grace of the titular character. It’s important to note early on that this iteration was not developed by the series creators, Remedy, but instead by Triple A developer, RockStar Games. RockStar Games are the creators of such open world masterpieces as the Grand Theft Auto series and Red Dead Redemption. 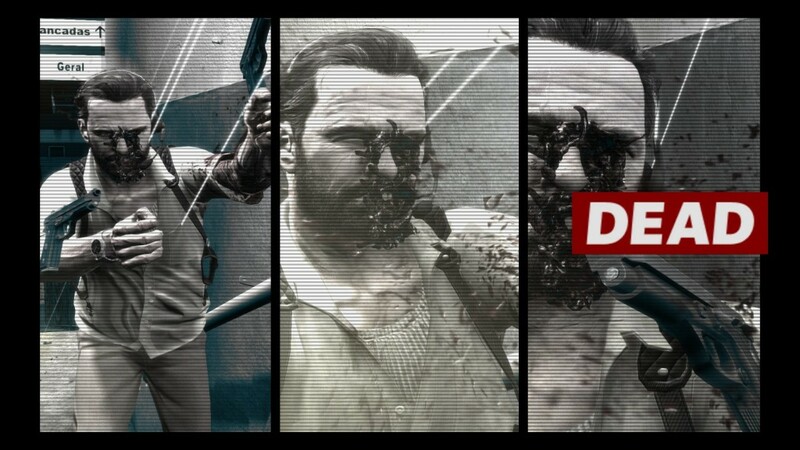 While the IP has changed hands, R* has taken the core of the Max Payne Franchise and built apon it’s heavy themes in an impressive emotionally believable way. Some of the more bizarre and goofy touches that had become a staple of the game series and of original series creators, Remedy (of Alan Wake fame), like corny television shows playing in the background (My Lord & Lady, Address Unknown) have been eliminated. As well as the graphic novel style narratives told between levels. Now all of Max’s hopeless rants are rendered and acted out live in the game engine using intermittent, super imposed “key phrases” appearing briefly onscreen to accentuate the narrative. When Max Payne’s older, paunchier look was first revealed in July ’09, I had some serious doubts as to the direction the series was taking. 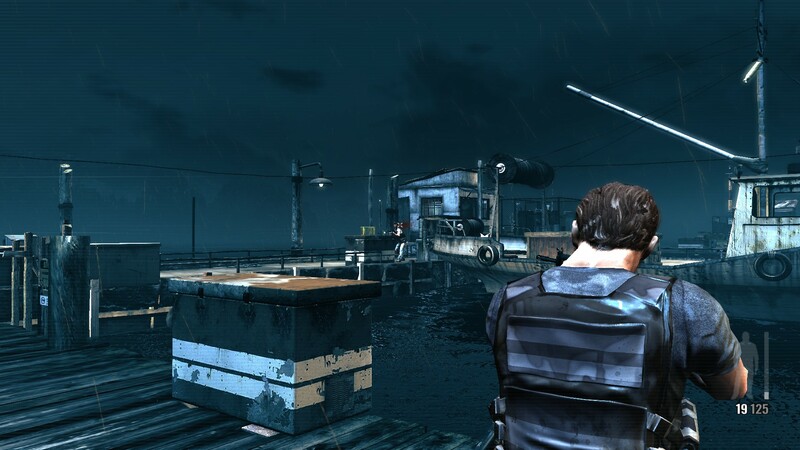 To transplant Max Payne from wintry New York to sunny Brazil seemed like it would rob the franchise of it’s unique noir style that had been carefully cultivated in the first two games. But as it turns out, Max can manage to be deeply depressing and morose, even in paradise. Max can manage to be deeply depressing and morose, even in paradise. Rather than having the environment draw parallels to Max’s own ravaged and rundown mindscape, the sunny and modern São Paulo locations create a stark contrast between Max’s own self loathing demeanor and the shallow world of youthful revelry around him. Max has been boozing and popping painkillers since we last visited him. He is wracked by guilt and remorse and has become little more than an emotionally crippled drunkard. After years of sitting on a bar stool in Hoboken, New Jersey, Max has been convinced by an old “friend” to come down to sunny São Paulo, Brazil to act as a body gaurd to the fabulously weathy and morally bereffed Branco family. Even on the job, Max can’t help but throw back a couple glasses of scotch to cope with the demons inside him that he tries to keep sedated. When all hell breaks loose and some thugs kidnap the trophy wife of his employer, Max has to take his head out of the gutter one more time to try and save an innocent woman’s life. 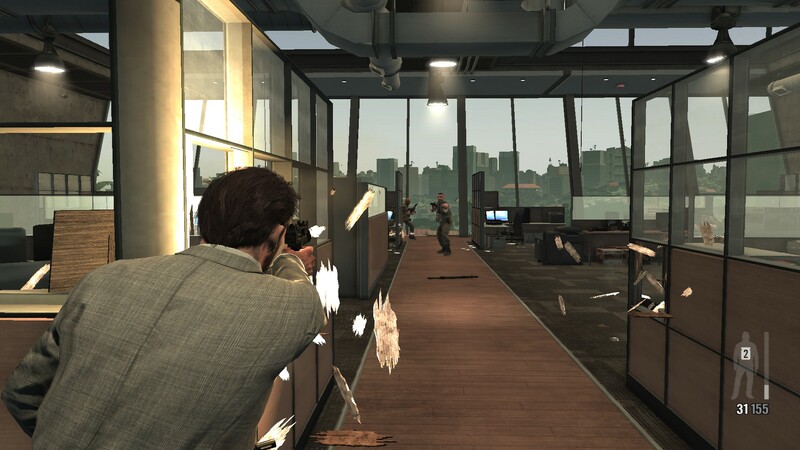 The original Max Payne single handedly created a new game design paradigm when it introduced the BulletTime mechanic to video games shortly after the similar effects seen in the first film of The Matrix Trilogy. Max Payne 3 manages to not only build upon that core mechanic but bring it into the 21st Century with it’s stunning usage of body animations and realistic physics. When Max enters BulletTime, the world fades to a familiar sephia tone very similar to it’s progenitors. The largest difference is when Max leaps into the air in one of his acrobatic GunKatta style barrages. If Max hits anything he immediatly falls out of BulletTime and hits the ground with a meaty thud. It adds a surprising amount of depth to gameplay. In previous games Max had the tendency to just “float” along a wall or obstacle if he collided with it while leaping through the air. This time around if Max is foolish enough to throw himself into a static obstacle he will realistically slam into the wall, his body contorting in pain as he collides with the environment. …this time around Max Payne can’t jump. Not to shock you, but this time around Max Payne can’t jump. He still has the signature ability to leap into the air and twist around while firing at enemies. He also has learned an especially useful new trick of being able to remain prone after he lands and continue firing off shots from the ground in an impressive feat of the game engine’s (the same used in GTA & RDR games) NaturalMotion animiation technology. But there is no way to simply jump onto an object, like a coffee table or recliner. In lue of being able to leap onto a bar top and then break into a Shoot Dodge (John Woo style) you do have the ability to “vault” over or lift yourself up onto certain objects, though these are contextual and you can’t say, hop onto the back of a couch and then off it in slow motion like you used to. While in the end there is no great loss in general mobility the lack of a dedicated jump button feels a little TOO streamlined, where the game is placing boundaries on your actions more than it needs to. The gunplay is a ballad of blood and lead. Those are basically the strongest complaints I can launch against Max Payne 3′s core gameplay. The gunplay is a ballad of blood and lead. Never before have I felt so assured that the bullets I’m firing are doing massive, internal injury to my foes. Huge gaping wounds explode open on enemy’s skin as actual modeled projectiles puncture their bodies. Head shots are consistently a one-shot affair no matter what the distance from the enemy. This was especially refreshing as it respects the fact that a bullet while in motion remains as deadly at a few paces away or across a great distance, like say a South American Soccer Stadium or a New Jersey Rooftop. Max Payne 3 is a technological achievement. It makes great use of R*’s inhouse RAGE engine and takes some impressive technical leaps forward as it implements Direct X 11 rendering technology. The Graphics options screen is repleat with daunting acronyms: FXAA, MSAA, SSAO, HDAO. You don’t have to be an expert in graphical lingo though, you can simply experiment and cherry pick just what type of effects you want to enable. A tally at the bottom displays the amount of video memory you will be using and assists you in determining the limits of your video card’s on-board memory. Finding a good balance between graphical splendor and smooth performance can be a challenge however, because the game requires you to restart after most adjustments (making side by side comparisons of graphical fidelity and performance difficult to objectively determine), but it sure is nice to see a modern computer game’s option screen have more than a “VSync On/Off” option. You simultaneously feel pity for the man, but also a disgust at how he is utterly bent on being completely miserable. Max’s torment is more realistically & convincingly portrayed than just about any other emotionally driven character I’ve seen in a video game. The man is a wreck. Haunted by the past and neck deep in a serious alcohol and drug addiction. After hours, Max can barely function as he imbibes prodigious amounts of drink and pills. His addictions bleed into his professional life as he finds himself regularly engaging in bloody gun fights while inebriated or what seems to be infinietly worse, while hungover from the night before. You simultaneously feel pity for the man, but also a disgust at how he is utterly bent on being completely miserable. 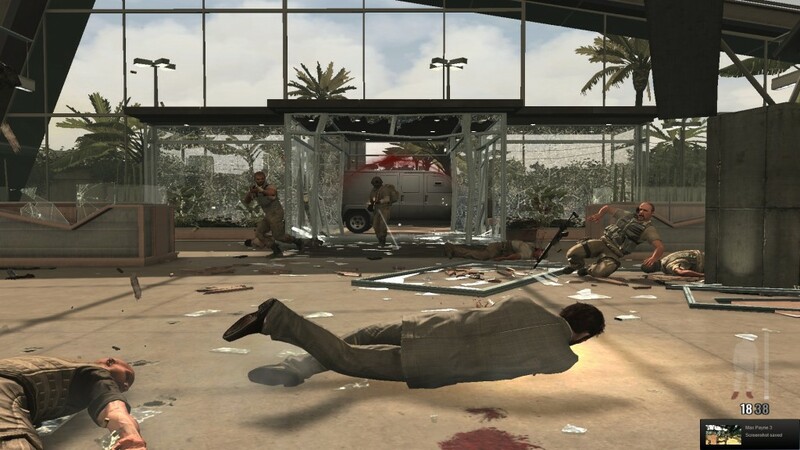 Max Payne 3 is a challenging game. Sometimes punishing and unforgiving. On the default Medium difficulty setting you will often find yourself dying repeatedly during carefully scripted gun fights with a dozen opponents. It may take many, many tries to successfully outmaneuver and out shoot while vastly outnumbered, but when you do your success feels well earned and the challenge a fair, if severe one. The following is a list of noticeable systems or mechanics that have either been added or eliminated from the Max Payne experience. 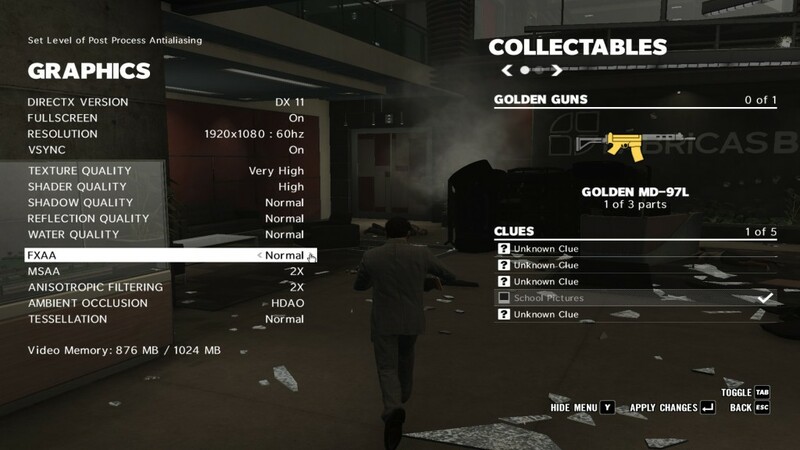 Rather than using the legacy weapon system of lugging around a dozen-or-so weapons, Max Payne 3 uses the modern convention of the “two weapon limit” – though in this case it’s a “two small weapons, and one large weapon limit, except if you duel equip your smaller weapons than you automatically discard the larger weapon”. At first it’s a bit confusing but it lends to the realisticness of combat, as you can see Max lugging his entire arsenal around with him. You will find yourself continuously making tactical decisions. Like whether or not to pickup that Uzi because your low on Pistol ammo, or swap your automatic rifle for a shotgun because you’ve found yourself in a more confined area. 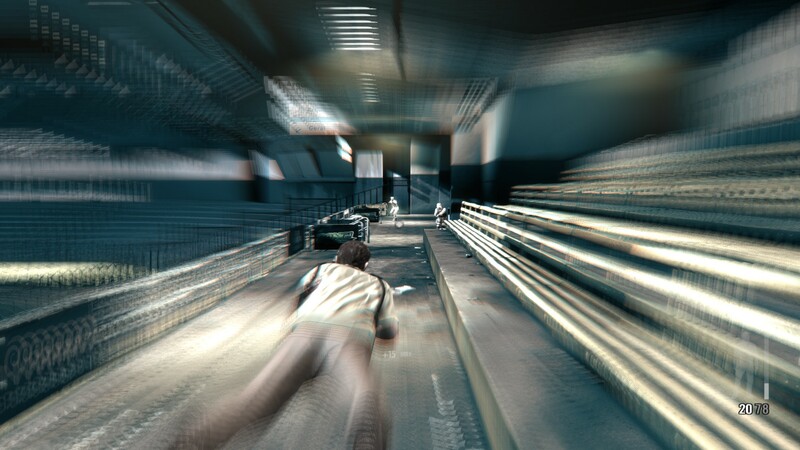 Max Payne 3, like virtually all third person games in this era uses an offest camera view which at first may take some time to get used to, or atleast it has always thrown me for a loop. Your reticle always remains in the center of the screen but Max appears to the left or right of center screen, this is only an aestetic choice but in MP3 it does create a slight learning curve. Max Payne 3 now features a cover system which works as well as any other properly implemented cover system (Mass Effect, Gears of War). You can blind fire or expose yourself to make a aimed shot, or hide behind a wall or crouch against a crate to reload. Thankfully there is no “health regeneration” system, though your BulletTime meter does fill simply by being fired upon (but not specifically being hit). This means if you wait in cover long enough you can emerge with a full bar of BulletTime, rather than collecting a small amount of that resource when terminating an opponent, as in previous titles. 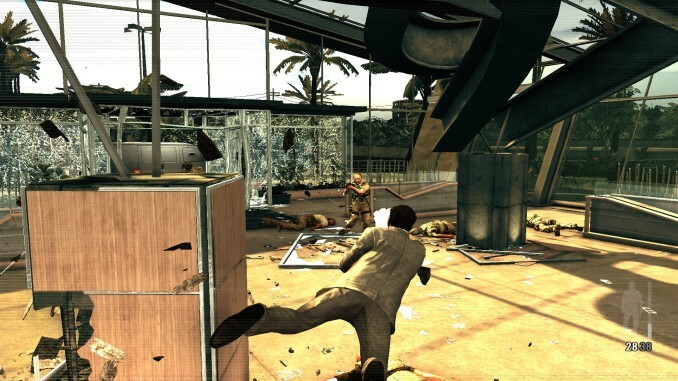 Max Payne 3 also features a new “last stand” system similar to the one used in Borderlands. If and when Max is fatally wounded, and he has at least one bottle of painkillers in his possession, there is a window of oppurtunity to defeat the attacking enemy and avoid death as your body falls to the ground. Because of this welcome new mechanic, bullets seem to be far more harmful as you may find yourself escaping near death multiple times per gunfight. Max doesn’t use grenades this time around, which is a shame, because enemies are often presented in large clusters that would very organically lend to an explosive’s utility. It’s even more unfortunate considering the fact that the enemies do have access to grenades. Progress is saved on a “per battle basis” – rather than constantly hitting quick save, each gun battle is basically a checkpoint so if you die you only lose a minute or two of progress. It’s a missed feature though because I always thought one of the most fulfilling features of the last Max Payne game was the ability to save right before you entered a room full of enemies and to purposely make a few attempts to kill them in the most stylistically appealing and cinematic way possible. Using a checkpoint system makes the game feel more linear, but it does do away with that unfortunate scenario of accidentally quick saving right as an enemy blasts you at close range with a shotgun. At first, I wasn’t able to get MP3 to load past the “Initializing…” phase, eerily reminiscent of the issues I had getting LA Noire to run (same engine, same problem, same solution). What eventually worked was going into the game directory and manually installing the RockStar Social Club application, which is essential in creating and maintaining a profile for this and other RockStar Games, and executing the MaxPayne3.exe application from the installation directory and not through Steam‘s taskbar icon. The most bizzare bug I encounted is random “Pausing” – not freezing, studdering, or slowdown. The game actually randomly seems to hit the ESC key without your consent and bring up the main menu periodically. It’s a puzzling issue that will likely be addressed in a future patch but as of one official patch released, it remains a persistent, though minor annoyance. Max Payne 3 looks amazing, has tight visceral action and precise controls, as well as a hard hitting story that actually makes sense. 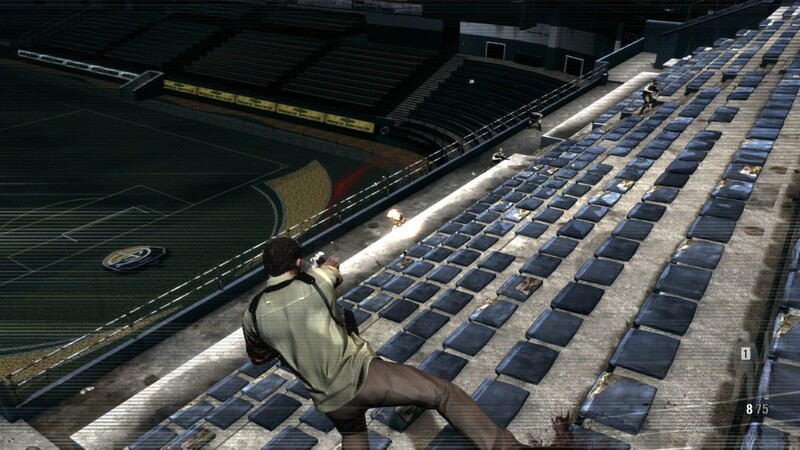 As with the other games in the series, the funnest part about Max Payne is entering a room full of thugs, launching yourself into the air and trying to place a bullet in the skull region of each of your antagonists before hitting the ground. Max Payne may have changed developers, but the core of what made the previous games such outstanding single player experiences remains intact and has been impressively tweaked and honed to create a modern and worthy new installment in the series. Why so high? Stunning graphics, Amazing gunplay, Worthwhile emotional investment in storyline. Why so low? No dedicated jump button, “three weapon limit”, no grenades. Pro Tip: Change your reticle option in the Gameplay Menu to “Always White”. On the default setting the reticle turns red (or virtually disappears) when it is over an enemy.